The Philippines, officialy known as Republic of the Philippines a beautiful Country in Southeast Asia lying on the North Pacific Ocean. Over 7100 Islands and around 90 Million people call Philippines their home and a country that is famous for its amazing coastlines that is over 320000 kilometers long, Paradise a like beaches and extremely friendly locals makes it a must visit place. Especially divers will like it here since the Pacific Ocean is known to have one of the deepest trenches. Our Intersting and Fun facts about the Philippines will convince you to visit this nice country. What do they speak in the Philippines? Philipinian? They speak Filipino, you will find a lot of spanish words and words that sound similiar to spanish. English is their second language. Their currency is the Philippine Peso (PHP) and major exports (despite coconuts) are semiconductors and garment products. Philippines was a Spanish colony from the years 1521 to 1898. After that, it became US territory until 1946 when it gained independence. The Philippine University of San Carlos in Cebu City which was founded by the Spaniard in the year 1595, is older than the Harvard University and is even the oldest university in Asia. In 2010 the Philippines produced over 19 million coconuts, making it the world leading producer of coconuts. In a province of Camiguin, there are more volcanos than towns. The island has the most number of volcanoes per square kilometer in the world. Luckily there haven’t been any eruptions since the mid 1950s. There are more than 200 volcanoes, but only a few of them are active. 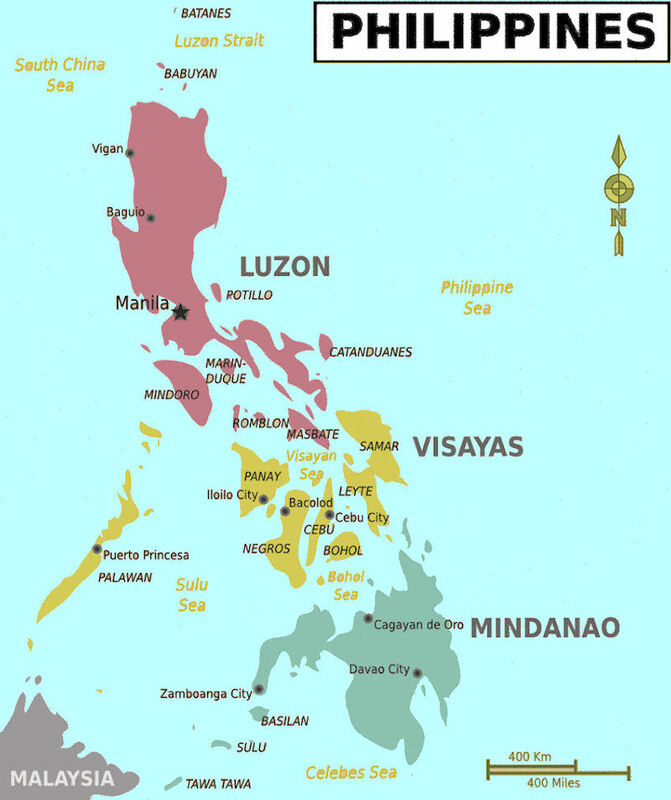 Most of the Philippine islands are mountainous. Earthquakes are common, some active volcanoes dot the landscape, like the volcanoes Mt. Pinatubo, the Taal Volcano and the Mayon Volcano. The “Conus Gloriamaris”, which is on of the rarest and most expensive seashell in on the plane and is one of the 12000 species of seashells that can be found in the Philippines. There are over 488 coral species out of the toatal 500 coral species known worldwide, can be found in the archipelago. The Philippines is home to the 2000 year old Banaue Rice Terraces in Northern Luzon, often called by the filipinos the 8th wonder of the world and are a UNESCO Heritage Site. On the island of Mindanao you can find Mount Apo, which is the highest point in Philippines. The height of this mountain is 2954 meters (9900 feet), making this one of the philippines interesting facts. In Palawan, the Puerto Princessa Subterranean River is over 8 kilometers long and is the second longest subterranean waterway in the world (after the underground river in Mexico). Philippnes weather is tropical through out the whole year with an average temperature of 90 degree and they have only two seasons: Summer sesaon and rainy season (monsoon season). Summer seaons is from November to April and the monsoon season the other months. In many places of the Philippines rum is cheaper than juice. A bottle of beer costs less than a dollar. Philippine nurses are highly in demand due to their good medical education not only in the phils itself but through out the whole world, probably the most demanded nurses in the world. This fun fact also makes Philippines as a good retirement place. One of the cool fun facts about the Philippines is the it is the only country in the world whose flag is hoisted upside down when the they are at war. Filipinos are the 4th largest immigrant group in the U.S. After Mexican, China and India. Philippine females are called “Pinays” and the males are called “Pinoys” or Filipina and Filipino. Filipinas are considered to be the best wives in the world, due to their raising. Speaking of filipinas, two Filipino beauty contenders, Gloria Diaz and Margie Morgan won the title of Miss Universe in the beauty pageants in the years 1969 and 1973. Share this post with your friends, filipinos and filipinas.